What do you picture? Sitting poolside at a fancy resort? Lying on a tropical beach with waves crashing in the background? Now picture yourself leaving the gym… dripping with sweat after a hard workout. That’s right. Millions of people throughout the world are turning to coconut water as a post-workout beverage. Coconut water is one of the fastest growing segments of the beverage market. According to the Wall Street Journal, sales have doubled every year since 2005. And it’s all thanks to the health and fitness crowd. But is the craze for coconut water all that it’s cracked up to be? Is “nature’s sports drink” better than Gatorade? Richard Bloomer, Ph.D., a researcher from the University of Memphis, set out to answer these questions. His study, published in the Journal of the International Society of Sports Nutrition,1 monitored 12 men during four separate runs on a treadmill. They had five days of rest between each run. After each exercise session, the men received bottled water, pure coconut water, coconut water from concentrate, or a commercial sports drink (think Gatorade or Powerade). During the recovery periods the researchers measured hydration. They also tested their “time to exhaustion” on a treadmill after they were fully rehydrated. Dr. Bloomer found no significant differences in hydration or performance between any of the beverages. There was just one, small catch. He says that coconut water or a sports drink would be better for rehydration following strenuous exercise in the heat. They monitored eight males during three runs. The men received plain water, coconut water, and a sports drink during a two-hour rehydration period. There was a one-week rest period in between trial runs. This team of researchers also measured hydration before and after exercise. Again, they found that all of the drinks performed equally. But not so fast. That doesn’t mean that coconut water and sports drinks are equal. Chhandashri Bhattacharya, Ph.D. from Indiana University Southeast analyzed coconut water, Gatorade, and Powerade.3 She presented her findings at the recent National Meeting & Exposition of the American Chemical Society (ACS). “Coconut water is a natural drink that has everything your average sports drink has… and more,” said Bhattacharya. 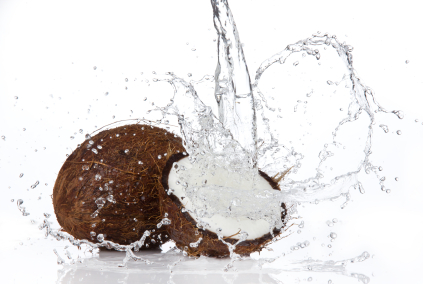 Coconut water contains five key electrolytes. And they occur in a perfect, natural ratio. These include sodium, potassium, calcium, magnesium, and phosphorous. Your body loses these important minerals when you exercise. It has no artificial flavors or colors. And it has less than half the sugar of Gatorade. More important, coconut water contains natural sugars. Most sports drinks have industrially-processed corn syrup. There’s just no comparison. Even non-athletes can benefit from coconut water. It’s good for re-hydrating during bouts of vomiting or diarrhea. It can also be used to recover from extreme heat and high altitudes. Your best source of coconut water is to buy young green coconuts (not the brown “hairy” ones) from the store. If your local grocer doesn’t carry them, try Whole Foods, Asian markets, and Farmers’ Markets. Fresh, young coconuts have a sweet, refreshing taste. So, just slice one open and refuel. You can also find coconut water in cans and tetra-paks. Just make sure you are getting “pure” coconut water with no added sugar. Check the ingredients. Coconut water satisfies thirst. It renews your energy. And it’s packed with vital electrolytes. It’s the healthy, natural alternative to sports drinks. Why go artificial when you can go all natural? And get more out of it. So, raise a coconut and enjoy. Check out (Bullet Proof) coconut Coconut oil and coffee a step above the rest.